People reach a certain age in life when they tend to reassess its meaning and importance. They may be reaching for a certain validity…struggling with the increasing loss of loved ones which pounds at the core of their being...feeling diminished by younger people who see them as a burden instead of an asset…wanting the end-stage of their life to matter more than it seems to, to themselves and those around them…needing love more than they used to and the constancy of those they most love and admire. Whatever the journey, poetry can sometimes help lift the spirit, offering a sort of music for the soul that can be reaffirming. Ruth Bugzester (1924-2010) was an artist of high accomplishment, a refined and gifted illustrator probably best known for her portraits. Little is known publicly about Ms. Bugzester’s life, although she worked for years across from the Parc Vendome on Manhattan’s West 56th Street. 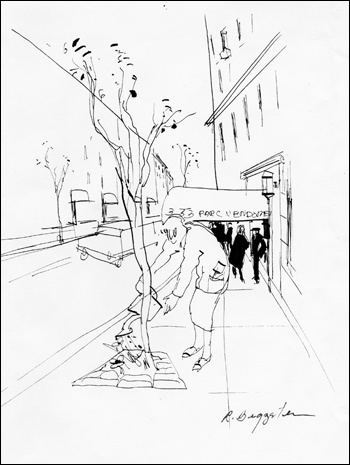 From her window, she captured a neighbor’s daily ritual of nurturing a tree outside the Parc Vendome apartments. One day, she knocked on this neighbor’s door—as the story is told—and presented this illustration, here titled The Watering Can, as a gift to her muse– in appreciation for the inspiring sight that so often met her glance from the window. —The poet speaks on the threshold of being. So says Gaston Bachelard in introducing Poetics of Space—a philosopher’s incredible journey into the value and power of poetic imagery in our lives. His journey is taken through a psychoanalytic look at the value and function of the space we inhabit, mentally and physically, from childhood into old age. He aims in part to rekindle the poetic imagery and dreams that fill our conscious and subconscious thought, and the space we "occupy." the way I came in. 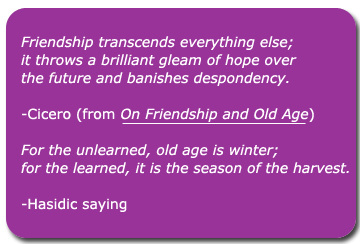 The selection of poems and popular quotes offered below is a tribute to aging and old age. They are inspiring and beautiful, sometimes fierce and haunting, always celebratory. Sonnet X, from Huntsman, What Quarry? Of facts . . . they lie unquestioned, uncombined. Is spewed all day the red triumphant child. when one is tired of love. Stillness and satisfaction of autumn. It must be wonderful to live and grow old. my father has faced all weathers, but it’s been a life! it's you I'm thinking of. I don't know who hears me. I also loved the thrill of thinking. then the sudden onrush of falls. its hemlocks bowed in snow. Words were my altar and my school. of life’s meaning, the songs of truth. thinking gives birth to words? to tell no lies while keeping death in mind. To write what was still unthought-about. There, a tiny flash—did you see it? Do not cloud the mind, says the Fifth Precept. to another without pausing for enough rest. or feel a pressure to keep talking. I asked a teacher how a cloud should sit. He said, Sit among clouds. following the homeless dog home! them unzip the shroud of the exhumed child. or wonder what opium would be like. from Earth, and a map of how to find me. (DSM-IV-TR, American Psychiatric Association, 2000). Lighter As We Go: Virtues, Character Strengths, and Aging is about living life fully and the joys and challenges of aging. It is a deeply researched book, written in a conversational manner. It hopes to inspire understanding, appreciation, and intergenerational dialogue. The two medical pros who wrote it are kind and gentle in their approach, show extraordinary sensitivity to women, and share their own wisdom and life experiences with generosity and trust. Mindy Greenstein is a 55-year-old clinical psychologist, psycho-oncologist, and consultant in geriatric psychiatry at Sloan Kettering Cancer Center (herself a cancer survivor). Jimmie Holland holds the Wayne E. Chapman Chair in Psychiatric Oncology at Sloan Kettering, founded the geriatric psychiatry group at the Department of Psychiatry and Behavioral Sciences at Sloan Kettering Cancer Center, and is Professor of Psychiatry at Weill Cornell Medical College of Cornell University. Dr. Holland founded the field of psycho-oncology and helped develop this field around the world. At age 85, she still practices psychiatry at Sloan Kettering. 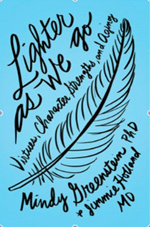 Reinforcing and informing the work of Greenstein and Holland are dozens of individuals, members of a Vintage Book Club with whom the authors interact, a large array of interviewees and case studies, and even family members. Poetry and philosophy have an important role in Lighter As We Go: Cicero’s wisdom from 2000 years ago (he is also featured at the top of this page) and that of A.A. Milne, Maurice Sendak, Art Buchwald, William May, and Judith Vorst among many others. “Nothing,” said Piglet, taking Pooh’s hand. The title, Lighter As We Go, is based on an understanding that we see things in greater perspective as we grow older, that we learn to “travel lighter” as we go. Among other things, we have greater wisdom and awareness, deeper knowledge of the world, fuller appreciation of love and the importance of caring, and an easier self confidence that makes us feel more secure within ourselves. Readers of the Purple Scooter Poetry website, and of this Poetics of Aging page in particular, will like Lighter As We Go (available from Amazon.com) – it tells us of the knowledge and wisdom we ourselves have, of habits we can nurture to live well in older age (or at any age), is sometimes sobering but always uplifting and positive. It is an affirmation of life, a celebration of life, poetic in a unique way. It will often make you smile! You may find yourself underlining passages throughout the book because they will resonate so much with your own experience. See www.theartoflivinglighter.com for more information about U-Bend research and about authors Mindy Greenstein and Jimmie Holland. but beautiful old people are works of art." Nothing is inherently and invincibly young except spirit. And spirit can enter a human being perhaps better in the quiet of old age and dwell there more undisturbed than in the turmoil of adventure. The Poetics of Aging, a September 2013 blog posting by Gail Spangenberg, editor of the Purple Scooter Poetry website: www.purplescooterpoetry.org/blog . The Art of Aging: A Doctor’s Prescription for Well-being, by Sherwin Nuland, 2008. Available in paperback and other formats from Amazon.com: “Reflecting the wisdom of a long lifetime, The Art of Aging is a work of luminous insight, unflinching candor, and profound compassion.” It depicts aging almost as an art form in itself.